KFYR 550 AM Radio will kick off this year's campaign with a 12-hour broadcast starting at 6:00 a.m. at the Kirkwood Mall, accepting cash donations and non-perishable food items. Open Your Heart will allow the selected families to shop at Target in the Kirkwood Mall from 7:00 AM to 10:30 PM. Please bring you notice letters with you. 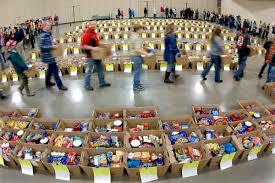 Volunteers are needed to sort, stack, and count all donated and purchased food items starting at 8:00 a.m. at the Bismarck Civic Center. Sorting and stacking should be complete by 10:30 a.m.
At 6:30 p.m. more volunteers are needed to pack baskets for the families. Tables are set up, each with a particular food item. Members of motorcycle clubs fill tote boxes with staples and volunteers pack baskets for the families. The volunteers move around the tables and food items are placed in the baskets based on the number of members in each family. After that is complete, by about 8:30 p.m., Boy Scouts and others take down the tables and sweep up. Open Your Heart campaign loads and delivers baskets. Volunteers are needed to add perishable food items to the food baskets and deliver them to the families. Starting at 6:30 a.m., Dan’s Supermarkets and Land O'Lakes deliver turkeys, chickens, bread, milk, and coleslaw, and volunteers help load vehicles. At 7:30 a.m., volunteer drivers delivering the baskets start arriving while other volunteers load their vehicles with the food baskets. After the drivers deliver the food baskets, any undelivered baskets are returned. Some last-minute families will get the undelivered baskets, with the rest being delivered to the Salvation Army, the Soup Kitchen and/or Ruth Meier's Hospitality House. By 10:30 a.m., the work is basically done and planning for the 91st Open Your Heart campaign for December 2020 begins. For question regarding deliveries call the Open your Heart Delivery office on Dec 21st at 701-355-1389.